Bookbinding and "End of Days"
Only one single commission for a Grimoire is produced every year. This is the 2005 commission. To apply to commission the 2014 Grimoire. Archangel and Binding Books "
Archangel Grimoire is 14.5 inches tall by 10 inches wide, it consists of 320 pages with hand marbled endpapers, it is full bound in veg-tanned virgin calf and coloured with 2 vegetable dyes. The Grimoire it'self represents the Enochian End of Days or the Seven Angels of the Apocalypse who stand in the presence of the Lord. 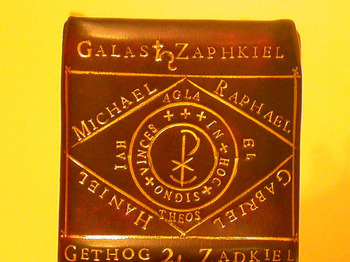 The first four Archangels are represented by their Seals on the front cover and are empowered by the Latin verse that accompanies them, they are: Michael, the Archangel of the North, Gabriel, the Archangel of the South, Raphael, the Archangel of the West, and Uriel, the Archangel of the East. 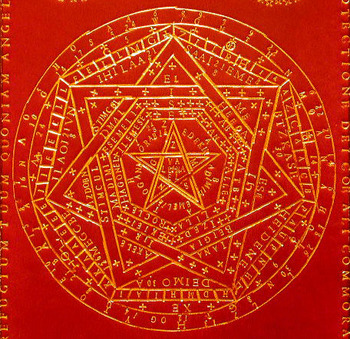 The centrepiece is a highly complex pentacle: The Sigilum Dei Aemeth, concealing or revealing the Greatest Name of God. 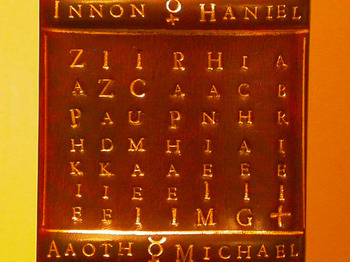 The 7 capital letters indicating the first letters of certain concealed angelic names. Of these 7 names, every letter containing an Angel of brightness; comprehending the 7 inward powers of God, known to none but himself, and sealed within by the ancient words of invocation that are gilt around its edge. The centrepiece also has the seals of the four Enochian elements in each corner each one represented by it's corresponding Archangel. 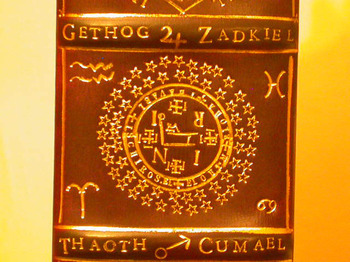 The spine of the grimoire consists of six compartments each with its own appropriate seal, the first being the christianised key of life based on the Egyptian Ankh. The second is Thavael, the prophet of the greatest one, this represents the circumcision of Jesus at Nazareth to which this spirit had a particular care over Christ. The third being the seal of Samael protector of Saint John during the time he dwelled in the desert. The fourth compartment shows the seal of Zadkiel also called "Righteousness of God" belonging to the ranks of the dominations, and considered by some to be chief, Zadkiel is considered to be an angel of mercy. The fifth compartment shows the Heptagon, the letters are derived from the Seven Archangels who stand before the presence of the Lord, the names of these Archangels are written vertically in a seven-by-seven grid, the cross in the final square representing the Earth. 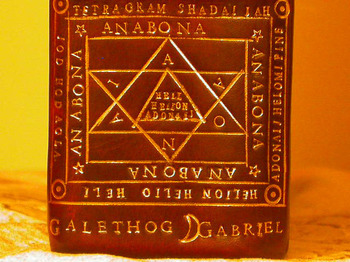 The final compartment consists of the Ars Almadel of Solomon, from which Solomon attained great wisdom from the chief angels that govern the four Altitudes of the World, namely the West, East, North and South of which these are divided into 12 parts, making every part 3, to which the Angels of these parts had shown him their particular virtues and powers. 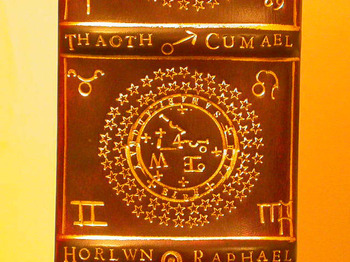 The Names to the right across the raised bands and to the head and tail of the spine are those of the Seven Angels, the names to the left are their true configuration derived from the Sigillum Dei Aemeth. The symbols between each name are their planetary virtues and the symbols in the corners of the 2nd,3rd and 4th compartments represent the virtues of the Zodiac. 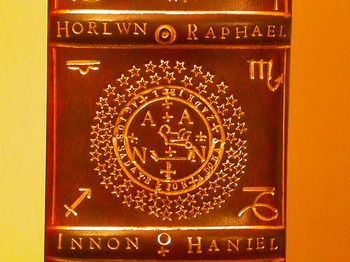 Only the front cover and spine of this book has been completed so far as the creation and blessing of each sigil is performed in the day and hour of its planet thus ensuring its empowerment, the back cover will comprise of the seals and sigils of the sixty or so Archangels of the highest dominations..........watch this space!